I woke up early this morning and put buttons on the swiffer cover so that it fits the swiffer head. I am really happy with the way this came out and I can't wait to use it on my dirty floors. Thanks for the comment yesterday. I'm mailing out some quicky knitted white bands, so if you want one, email me you address! That's a great idea! 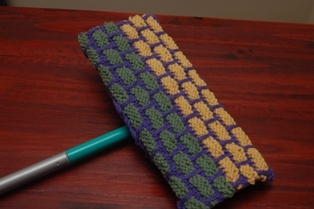 I made re-usable cloth pads for my mop that's sort of like a Swiffer, but I never thought of knitting one! Brilliant! you gotta let me know how that works out! 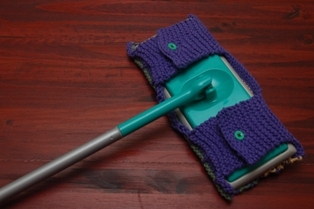 I love the swiffer cover. I might need to make one of those myself. How has it been working for you?